“Except that ‘Heaven Is for Real” turns out to be about cynicism and doubt for a sizable chunk of its running time — the struggle within those who already believe rather than the conversion of unbelievers. That makes it a surprisingly nuanced entry in the Christian film genre, even if the movie finally and firmly comes down on the side of angels, Day-Glo Elysian Fields, and Christ as nice guy incarnate. The faithful should welcome it warmly. Others may come away unconvinced while appreciating the film’s sincerity and lack of anti-secular axes being ground. I just finished reading “Heaven is for Real.” I am thinking that the Akiane Prince of Peace is very similar to the man in the Turin Shroud. STURP and now the Shroud Science Group with all its scientific books and journals cannot begin to match the power of this story. Four-year-old Colton Burpo left the hospital operating room and went [to] heaven where he saw Jesus. Later, he confirmed that Jesus looked like the Akiane Jesus. The Akiane Jesus looks like the Turin Shroud. The Akiane Prince of Peace? The book, Heaven is for Real? 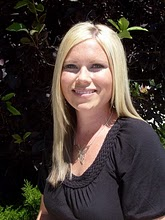 A kid who saw Jesus in heaven during some sort of purported near-death experience (NDE)? Really? And does this visionary picture look like the man in the Shroud? Akiane Kramarik seems to be a child visionary. Growing up in a home with an Atheist mother and a lapsed Catholic father, she apparently began having “divinely inspired visions,” which she translated into poetry and art. By age four (Colton’s age) she was painting and writing poetry. There can be no denying, at least, that she is a prodigy. She appeared on CNN, World News Tonight and the Oprah Winfrey Show. Forget that she is a child; her work is amazing. She was just eight-years-old when she painted Prince of Peace, her first portrait of Jesus. This is the painting Colton said was right. It is reproduced in the back of every copy of this best seller. . . .
. . . Yes, I’m sure that such a popular image, if indeed many people think it is similar to the image of a man on the shroud, will have an impact on belief about the shroud. Nonetheless, the goal of the Shroud Science Group (as was the goal of STURP) is not to sway opinion. It’s purpose is to pursue the scientific and historical truth about the shroud, whatever it may be and wherever it may lead, and to disseminate that information in a responsible way. That said, I say go read the book and make up your own mind. I’m intrigued but not swayed. Then again, it took me five years to conclude that the Shroud of Turin was probably real. Now, I should probably add, go see the movie. 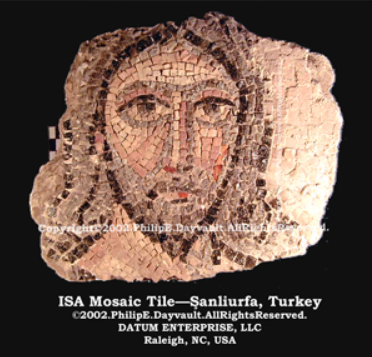 And now to the crux of the matter: Phil Dayvault, whose work has been discussed on this blog and who has participated with his own comments, has a new (or updated) web page, The ISA Tile and the “Prince of Peace” and a video that you should watch (you may need to hit the pause button if, like me, you are a slow reader of white on black). There is room for a lot of discussion here. How good are Dayvault’s methods? Can they be reproduced by others? Can the software be revealed and examined? I didn’t see any obvious morphing going on, but is there any? Tilting? Angling back to front? Changing horizontal and vertical proportions? Any other Photo Shop stuff I didn’t think of? Any control work with other faces? The Latest and Greatest Near Death Experience (NDE) So Far? "This book is a thunderbolt!" writes Dr. Rabbi Meir Sendor. "I stood at Eben’s bedside ready to read Last Rites," writes Rev. Michael R. Sullivan, Rector, Holy Innocent’s Episcopal Church in Atlanta, Ga. "With vivid detail and description, he invites you to walk with him to that place none of us has experienced yet in our humanity we know we shall one day certainly travel. Having survived a near death experience and brought his neurological expertise and background to it, we gain both the insight of the mystics in his poetic words and the reality of the physical world in his scientific explorations." 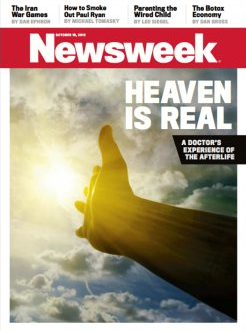 The question that many will ask is how this relates to the other big NDE story reported on here about a year and a half ago, Akiane’s Jesus, Heaven is for Real and the Man in the Turin Shroud. Dr Eben Alexander’s near-death experience is the most astounding I have heard in more than four decades of studying this phenomenon. In my opinion, Dr Alexander is living proof of an afterlife. The extraordinary circumstances of his illness and his impeccable credentials make it very hard to formulate a mundane explanation for his case. For me, it is difficult to shake the feeling that his experience was somehow divinely ordained. 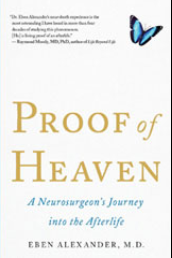 Dr. Alexander’s book Proof of Heaven deserves to be a major international bestseller, and I believe it will be. I am confident that Dr. Alexander’s story will capture worldwide interest. It will inspire many to accept that there really is life after death. I suspect his book will be a global game-changer. It has seismic implications and may help humanity arrive at a more accurate understanding of life’s true meaning and purpose in the larger sense. Dr. Eben Alexander’s near-death experience stands as perhaps one of the crown jewels of all near-death experiences. The knowledge of what he experienced raises the bar for serious investigators and pundits. It marks the beginning of a new era of rational investigation of humankind’s deepest mystery, life after death." More than a year ago (February 23, 2011) I wrote what turned out to be the most popular posting on this blog: 160,000 page views this year alone, 522 comments with little subject drift, numerous emails, etc. Last year, I wrote to you after reading the book “Heaven is for Real.” You said my letter threw you for a loop. But you published it and I have since had the most wonderful opportunity to read and think about the hundreds of comments that followed. Thank you. Did you happen to notice “Heaven is for Real” is still on the New York Times list of non-fiction bestsellers. No, I hadn’t noticed. But now I see that it is #3. It has been near the top for over a year, which must be some sort of record. Here is what I wrote a year ago. Read More below or click over to Akiane’s Jesus, Heaven is for Real and the Man in the Turin Shroud to see it as I posted it. Nice perspective by Lindsey K Rietzsch over at Stand a Little Taller on four images of Jesus: 1) "Christ in Red Robe" by Del Parson, 2) "Prince of Peace" by Akiane Kramarik, 3) Scientific Rendering "the Real Face of Jesus Christ" (as featured on the History Channel) by Ray Downing and 4) "Christ’s Image" by Heinrich Hofmann. 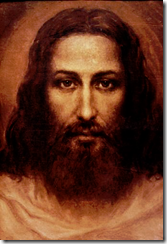 I have recently been drawn to various depictions of the Savior Jesus Christ especially those claimed to be the most accurate images of his face. It’s been spiritually uplifting for me to compare the similarities of these images and learn the stories behind the artists and their artwork. Here are the four I found to be most fascinating. At the bottom of this blog post I share with you my thoughts and feelings about the real face of Christ. 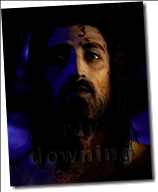 AND: Here is a link that brings together several recent postings in this blog that have included the Akiane image of Jesus. Many months later, thousands of people were discussing the two portraits of Jesus. Among them were scientists from Russia who noted that Akiane’s Prince of Peace had a remarkable resemblance to the mysterious image taken from the very Shroud of Turin. That mysterious image was probably the Ariel Aggemian painting based on a photograph of the shroud. The Jesus we see in Akiane’s painting looks just like the Aggemain’s painting of Jesus. 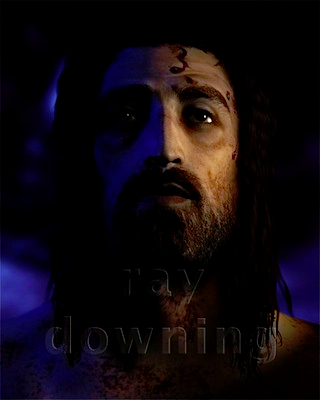 The computer generated image of Jesus prepared by Ray Downing for the history channel is further confirmation of something going on here. I’m just not sure what that is. In the beginning, Akiane drew pictures of family members and pets, but her interests eventually shifted to the creation of faces. She started “scribbling” more and more faces. She tries to recreate visions that she says God gives her in her dreams. “I always think about Jesus and talk about Him,” she says. “I was looking for a [Jesus] model for a long, long time, and when I couldn’t find anyone, one day I suggested to my family to pray all day for this model so God would send the right one.” The day that they prayed, a very tall carpenter — yes, a carpenter — came to their door looking for work. When he showed up, Akiane nearly fainted. “I told my mother that that was him. I want him to be my model,” she recalls. Akiane’s day is a little different from other children her age who are homeschooled. When she wakes each morning she has a drink of water, exercises, prays, and then she paints. 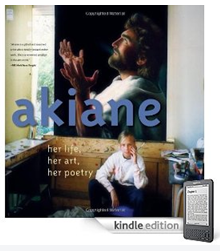 Akiane hopes to fund such projects with the sale of her paintings and poetry. According to her agent, Akiane soon will embark on a world tour to raise money for the African AIDS crisis. I don’t know what to think at this time. 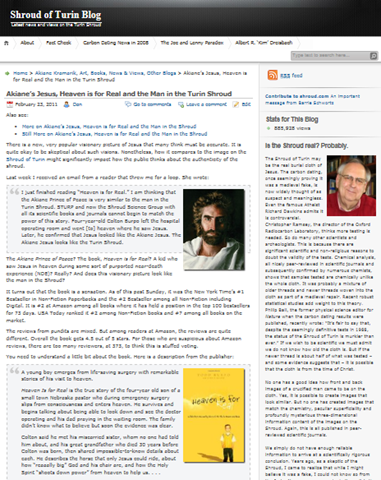 These comments pertain to Akiane’s Jesus, Heaven is for Real and the Man in the Turin Shroud. This idea that the Akiane portrait looks like the Shroud face or the face developed by the History Channel assumes that Jesus had a haircut or a full salon treatment sometime between the time he was in the tomb and the time that Colton saw him. I’m dubious of the account in the book but I can’t rule it out. There is a resemblance. Actually, the image was developed by Ray Downing and his team for the History Channel. 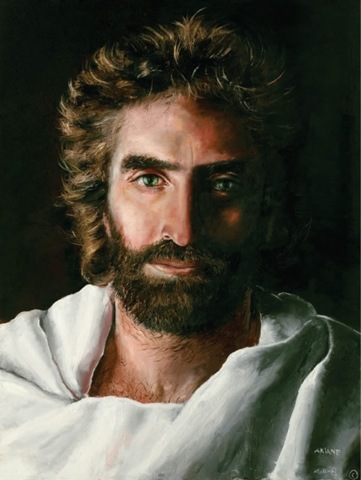 I think the painting of Jesus by Akiane Kramarik looks like the Shroud inspired painting of Jesus by Ariel Aggemian. Given that I have reservations about such visions or near death encounters, I find it very spooky. The Akiane looks like the St. Catherine Pantocrator with a new hair style. Maybe Akiane’s vision was the face on the Shroud. Remember that a vision is just that, a vision. It could come from a book or a picture in the news. The memory of a seven-year-old child being asked over and over to remember what he saw at age four is also something to take with a grain of salt. But they do look similar. You all see a bit more than I do. But, yes, there is some resemblance. Anyway, here is a key to the images: The man with short hair and white clothing is the Akiane painting. The sepia toned image is the Ariel Aggemian inspired painting. The one with the deep blue shadows was created by Ray Downing for History. 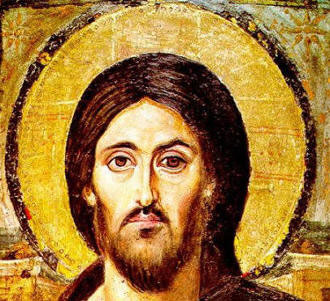 And, of course, the Pantocrator, almost certainly inspired by the Shroud of Turin, is the one with the big golden halo.